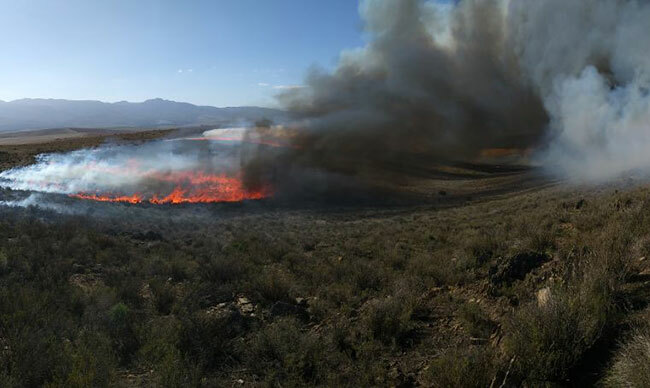 Ecological burns are an integral management tool within fire driven ecosystems such as the Renosterveld of the Overberg. The ecosystems have evolved to require the massive disturbance that is caused by fires and it is always incredible to see the renewal that comes with the onset of spring in a fragment that has undergone an ecological burn. The amount of planning that goes into an ecological burn is very intensive. In the fragmented natural landscape of the Overberg one must ensure that a mosaic of veld ages is maintained across various remnants to ensure that all biodiversity is protected and stimulated. Through management plans we develop a strategy of ensuring that this comes to fruition, but it is the first step in a long journey. Surveys need to be implemented to determine the best conditions for the burn and then firebreaks must be prepared. Permits to undertake controlled burns must be applied for which involves site inspections and completion of paperwork. Meetings with neighbouring landowners must be secured and a strategy for implementing the burn agreed upon. Once the logistics are in place the waiting game kicks off. Every burn is different and requires a different set of conditions – humidity, temperature and wind direction. Permits allow for burning Monday to Thursday and exclude public holidays and it often happens that the conditions you are waiting for don’t materialise during your open window. Sometimes the conditions are perfect but wind speed throws everything into disarray and you need to err on the side of caution. This is especially true when you have several ecological burns to implement. 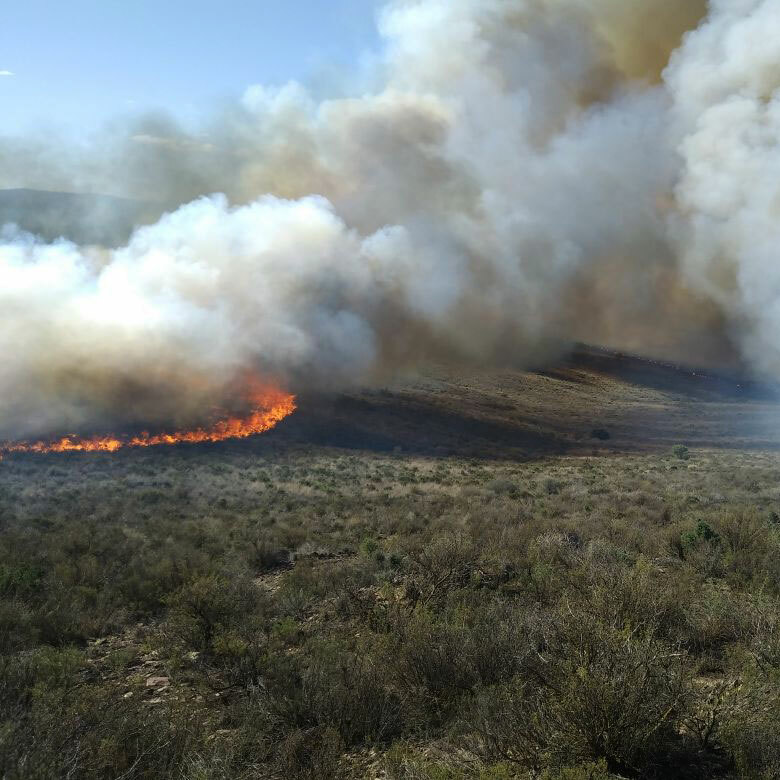 The ORCT has 6 Renosterveld remnants that where scheduled for ecological burns in the 2018 fire season and waiting for all conditions to be in place has been a far longer process than we would have liked. Yesterday, we conducted a controlled burn south of Riviersonderend in conditions we have spent weeks waiting for. 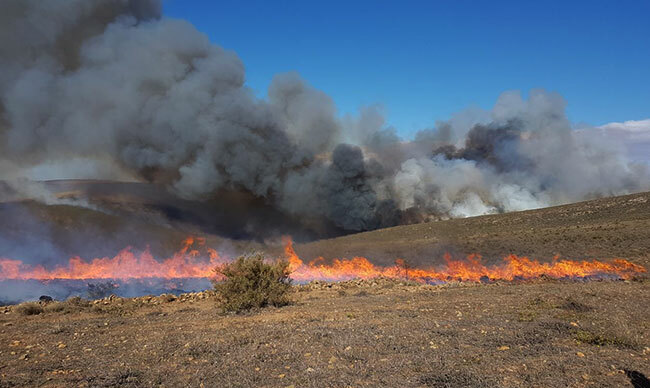 Ideally, we would never recommend or support burning Renosterveld in May, but this is one of the few occasions that the long running drought in the Western Cape has worked in our favour. The bulbs that we would have expected to start flowering have not yet done so and the ‘greening’ of fragments that we would have expected at this time of year has also not yet taken place. 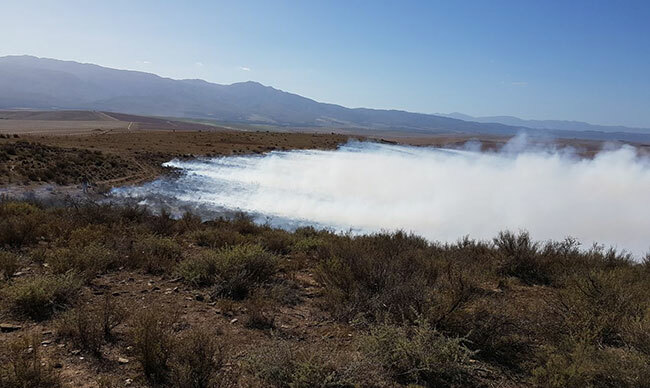 Most fragments still appear to be locked into the height of summer and after inspections of the veld it was determined that implementing a burn in May would not adversely affect the biodiversity on this site. So finally, we get to the stage that we can strike matches and implement the burn. And now we join the rest of the Cape in hoping for good winter rains and excitedly await the spring flower season. Keir brings significant experience and expertise to the Trust, formerly working with CapeNature as their Stewardship Extension Officer. Keir was involved in implementation of CapeNature’s Protected Area Expansion Strategy, which included assessments of critical biodiversity areas, extension with landowners and proclamation of Nature Reserves. Prior to holding this post he has worked in wildlife management at Sanbona Wildlife and Shamwari Game Reserves.